OWATONNA — A new program is now in place at Owatonna Hospital to help people who have been victims of sexual assault. The hospital has instituted the Sexual Assault Nurse Examiner program after identifying a need for a sexual assault program to serve Owatonna and surrounding areas. Four nurses in Owatonna went through a five-day, 40-hour training course through the Sexual Assault Response Service. According to Lori Pfeifer, the sexual assault program coordinator for the Crisis Resource Center of Steele County, one in six people will be the victim of a sexual assault at some point. Pfeifer said the program is very beneficial for the community, and thought it could make a difference for victims to see a medical professional who is trained to handle a sexual assault situation, which may not have always happened in the past. “Any time someone is in the unfortunate position of being sexually assaulted, they need to be able to go into an ER that’s full of understanding and empathy, and that’s exactly what the nurses are trained to do,” Pfeifer said. The nurses trained in performing exams with Obstetrics and Gynecology staff and nurse practitioners at Mayo Clinic Health System — Owatonna. 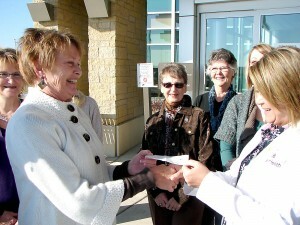 The program also received funding from the Owatonna Hospital Auxiliary, which donated $2,500. Thrivent Financial in Owatonna also contributed $500. The program will receive a digital camera and memory card to document evidence, along with toiletries, underwear, sweat pants and hooded sweatshirts that will be given to victims. The program is available to anyone over the age of 12. Younger victims are referred to Children’s Hospital and Clinics of Minnesota in St. Paul.